The Tarot deck created by A. E. Waite and Pamela Colman Smith in 1909 is the world’s most popular Tarot deck. However, A. E. Waite later returned to Tarot and ten years later created another set of 23 Tarot images, to be kept for use in his private Fellowship of the Rosy Cross. A century later, these images can be revealed for the first time, in over 80 colour and b&w plates, extensive commentary and biographies, researched, revealed and discussed by Marcus Katz & Tali Goodwin, with a preface by Mary K. Greer. The hardback edition (250 copies) sold out almost immediately and is so treasured by owners that it is neither available new or second-hand. Due to high demand and requests, we have now negotiated a new license for a softback reprint in a limited edition of 250 copies only. In this book you will be introduced to these mystical and sublime images, and given ways of using them for your own contemplation in an ancient technique termed “Lectio Divina”. You will be shown how they correspond to the Tree of Life and discover Waite’s hidden mystical system for spiritual development illustrated by the Tarot. The book also contains original sketches and paintings by J. B. Trinick, forgotten for over thirty years in the British Museum, a full set of the b&w plates produced from the images, in addition to extensive research, family background and artistic context for the images. “Abiding in the Sanctuary awaited me when I arrived home from a long working day away. It glowed through the carton in a strange white-silver misty festive light (like the halo of old gas-lamps). I am lost for words. The images have an entirely unique quality, they are definitely not meant for cards…. I will write more, when I have regained myself.” S.
“Oh my. Oh my. Oh my. Abiding in the Sanctuary has arrived at my home this evening. I can hardly believe I have access to it. WHAT a gorgeous book it is, well worth the (short) wait and well worth the money. I cannot review it as I haven’t yet read one word of it, but I can assure anyone who hasn’t seen it yet that it’s stunningly beautiful and the contents look incredibly promising. Some of the illustrations have already brought tears to my eyes.” M.
“I just cannot believe how quickly this book arrived at my house – just as Tarosophy did a few months back. I am thrilled with it. Am forcing myself to read it front to back so have just gotten to the start of the Trinick biography, and haven’t yet done more than flip through the amazing images at the back–I want to get to them in order and read the background first. Have enjoyed hearing about the synchronicities involved in the research and publication. This is truly a treasure of a project.” M.
“…this book is stunning! It arrived today, and I have just begun to lose myself in these amazing images. I look forward to reading it this weekend. The book is beautifully produced, too. I am thriled to have a copy of this important historical work. 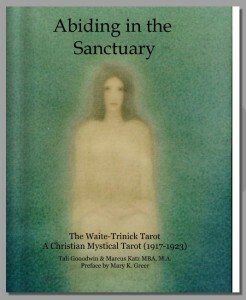 It will be a cherished part of my collection.” R.
“Abiding in the Sanctuary arrived today. A profound, sacred work …. having the tracing boards by Frieda Harris included was a nice surprise. Looking forward to immersing myself into this.” T.
“Got it 5 minutes ago…. Abiding in the Sanctuary has arrived! Super fast delivery, excellent packaging! The quality is second to none! The pages are full of fabulous! Stunning, every bit! Sumptuous Read. Absolutely Exquisite. I can feel the ‘Work without lust of result’. All focus, Love of research for this project…. It is felt.” G.
“OMG…. it’s just arrived and I am swooning… did a ‘sensing’ over it before opening and got some amazing pictures… Wow. I’m hibernating now so I can go cover to beautiful cover with it. I absolutely know the layers upon layers upon layers of existence …. actually, they are in moving conical swirls on the pages. Magic is as magic does. The respect and honouring of such material is booming out of the pages. I am so so so glad I have a copy … Words are not enough.” C.
“I just received my copy of Abiding in the Sanctuary in the mail. Oh Joy! Oh Bliss! Awesome. Transcendental. Mind boggling. Exquisite. Beautiful. Thought provoking. Enlightening. I love the back story on Waite, Trinick, Pippet, et al. I learned more about Waite and got introduced to the others. The material sets the context of the illustrations that follow. Wondrous. Beautiful. Mystic. Inspiring. Emotional. I could not stop staring at the images. I reviewed them quickly for an overall first glance, and then I reviewed each one of them slowly and quietly. They were amazing. I wish that these had been produced as a final deck of trumps. We can still wish… To think that these images have been asleep for decades, just waiting for the right person or persons to awaken them from their slumber. I’m so happy and thankful that Tali and Marcus took on the task of doing so. I can’t imagine the thrill and excitement they must of experienced when they first laid their eyes on these images. The love that they put into their work, however, is quite evident, and I’m glad they brought them forth into the Tarot community as they did.” M.
The paperback edition includes minor edits (as per addendum below) and is printed on high-quality lustre paper. The rarity of the hardback is such that in two years it has never been made available even second-hand, and we expect the paperback to be a similar investment. p. 9 We have been informed by a reliable source that A. E. Waite is in this group shot , sat to the left as you look at the photograph. p. 55 Minor typo, should be Milnthorpe Church, not “meilnthorpe”. Note that this is the church that is overlooked by the house in which John Trinck lived in his final years, viewing that stained glass window. Q. Are you going to produce a mass-market or e-version of this book? A. Not at this time nor in the foreseeable future. This present limited edition hardback is the result of a decade-long enquiry, almost a year of solid research, several unrepeatable synchronicities and a large investment of time and finance – even with a large community funding drive. We would not look to re-negotiate a commercial license for a while now, as we have other equally important Tarot projects to complete. 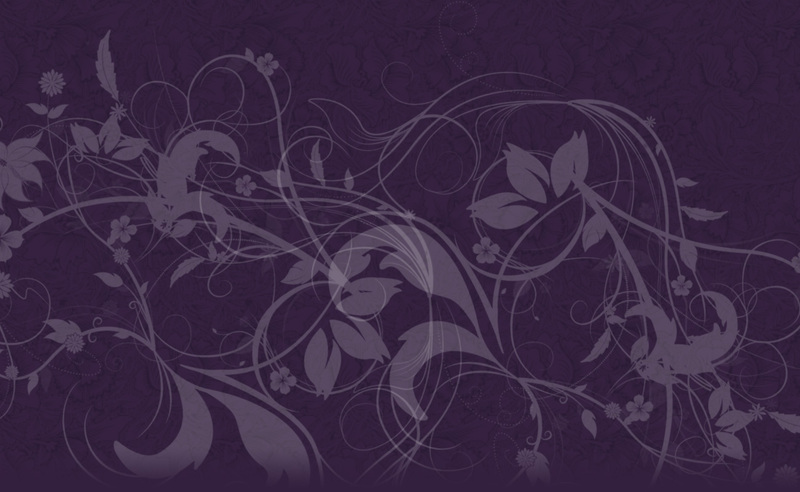 You can keep up-to-date with this and other Tarot projects at The Tarot Speakeasy Tarot Blog with Tali Goodwin. Q. Are you going to produce a deck? A. Not at this time. This is because of the reasons above, and also we wish to carry out some further research following on from the discoveries in the book. The images were not created for a “deck” or for divination/fortune-telling purposes, rather as contemplation and teaching icons, although they are definately Tarot..
Q. Why are there not more images available in the book preview? A. Unfortunately, whenever we have released images, despite licensing and copyright statements, they have been almost immediately copied and sometimes abused. We have had to ensure that the licensing is respected and our own private collection images are presented correctly within the book. Q. Where can I see the images that are part of the British Museum collection? A. The 44 images which were photographed from the album in the British Museum is available for online viewing here: British Museum Great Symbols of the Paths. These were made entirely possible by the gracious support and financial contributions of about 100 people, some of whom wished to remain anonymous. The sponsors are listed in the book, with our gratitude. These images are not the entire set of images made available in the book, neither are the 44 photographs the totality of the album. We selected all the colour images in the album, and several sample black-and-white sketches that showed the difference between the original sketch and the finished plate. Other black-and-white sketches which were very similar to the finished plates were not photographed and licensed due to budget constraints. There were other pages in the album which are referenced in the book but not reproduced in their entirety. If you link or reference the British Museum site, please be aware of their usage requirements and guidelines. 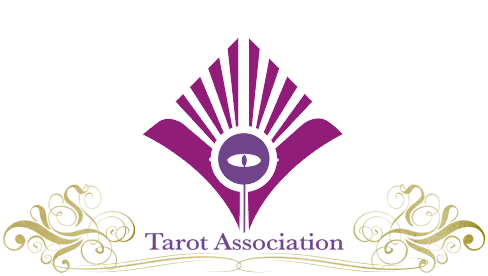 We would also appreciate that if you reference the site, you note that these images were made available for the public by the contributions of members of Tarot Professionals. Q. I have bought the book and have questions about the images. Who can I ask? A. 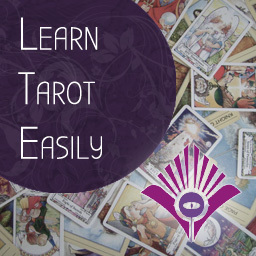 We have a dedicated study group in Tarot-Town.com for this purpose, for those who have purchased the book and wish to develop their appreciation of the images. A number of our members are leading authors of contemporary Tarot, and we are delighted to showcase their books. In these titles, you will discover the cutting-edge and new research in Tarot, innovative methods of reading, and a diversity of approaches ranging from ancient oracles to modern psychotherapy.